The parish was in the Bassingham sub-district of the Newark Registration District. You can also perform a more selective search for churches in the Brant Broughton area or see them printed on a map. The church is a large, Ancaster stone building. This chapel was rebuilt in 1812 and the remainder of the church was rebuilt in 1876 on the old foundations. The church seats about 300 persons. We have a fine description of the church provided by Renee REDSHAW of Australia. A photograph of Saint Helen's church is at the Wendy PARKINSON Church Photo site. 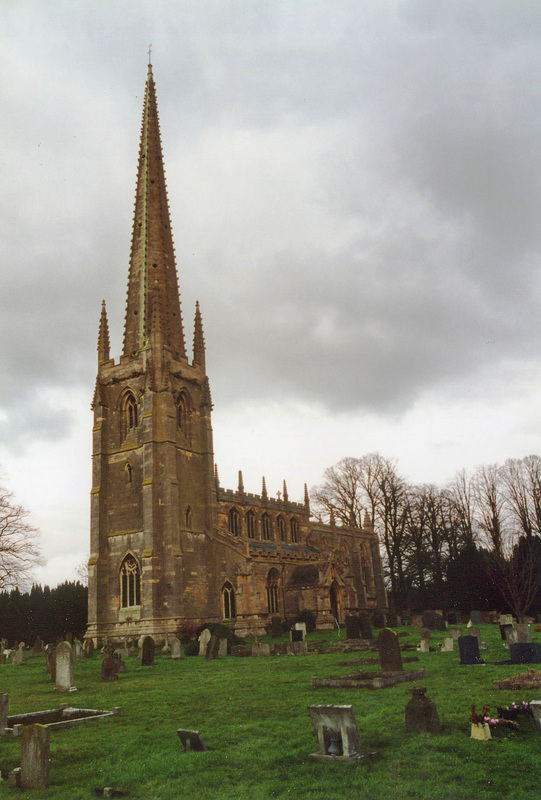 Richard CROFT has a photograph of St. Helen's Church on Geo-graph, taken in September 2005. The parish register is said to date from 1710, but the Bishop's transcripts start in 1562. The Lincolnshire Archives has parish register entries for 1710 to 1891. Parish marriages are recorded in Boyd's Marriage Index for 1561 - 1837. 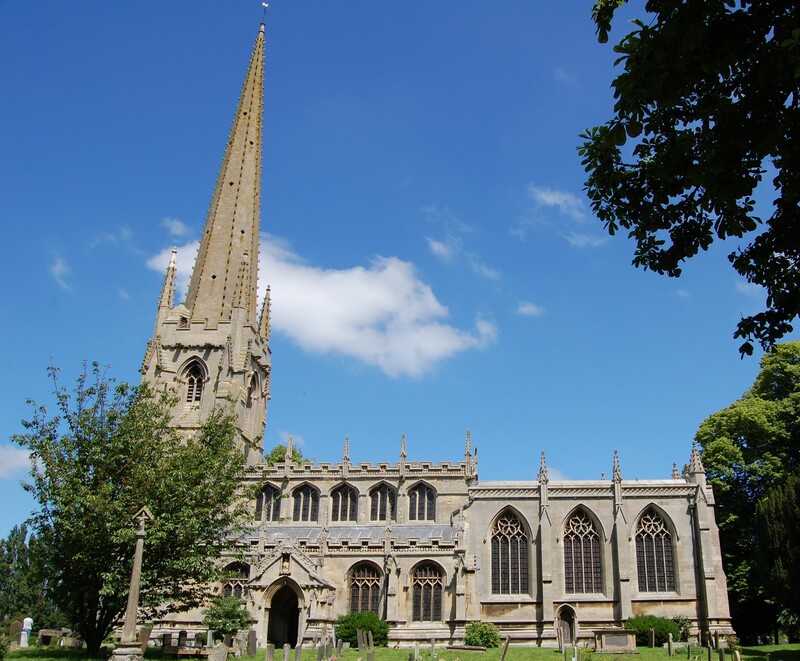 The Lincolnshire FHS has a Loan Library service which has the parish registers on microfiche for Baptisms from 1710 to 1812 and Marriages from 1710 to 1812. The LFHS has published several indexes (marriage and burial) for the Loveden Deanery to make your search easier. Although it is mostly for the CARTER family, you may want to check out our Parish Register Extract. There was a Society of Friends Meeting-house and burial ground here in the 1700 and 1800's. The Meeting House dates from 1701 and still stands near the centre of the village. Wendy PARKINSON provides a a photo of the Friends' Meeting House on Geo-graph, taken in June, 2006. The Wesleyan Methodists built a large chapel here in 1812, replacing it with a larger one in 1858. For information and assistance in researching these chapels, see our non-conformist religions page. Richard CROFT provides a photo of the Wesleyan Reform Chapel built in 1862 on Geo-graph. Photo taken in 2008. We have a list of 1878 Trustees of The Wesleyan Chapel that might interest you. Brant Broughton, not to be confused with Broughton by Brigg, is a parish and village about 8 miles east of Newark on Trent and 12 miles south of Lincoln. To the north lies Carlton le Moorland parish, to the south is Stragglethorpe and to the west are Stapleford and Beckingham parishes. The parish covers about 2,990 acres. The farms called Broughton Clays, two miles west of the village, are part of the parish. 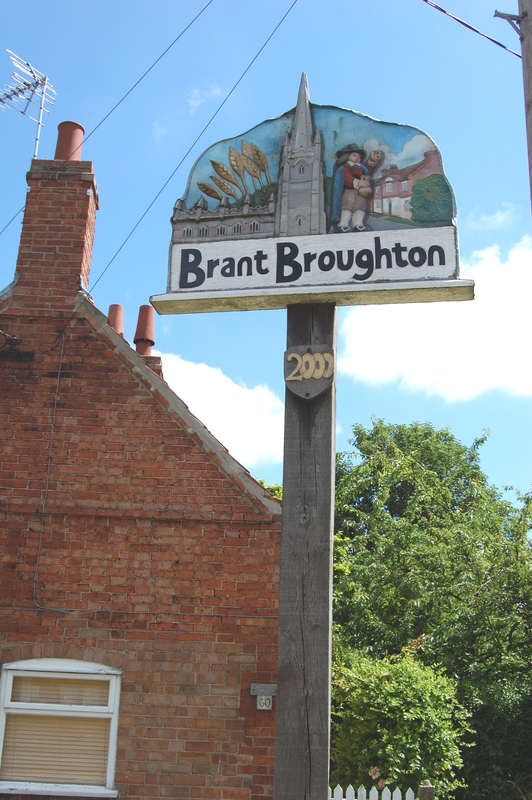 By automobile, the village of Brant Broughton lies just north off of the A17 trunk road between Newark and Sleaford. Richard CROFT provides a photo of the Village Sign on Geo-graph, taken in September, 2011. Stop in at the Village Hall and ask for a schedule up upcoming events. When you enter the village, look for the village sign (provided by Patricia McCrory, who retains the copyright). Ask for a calculation of the distance from Brant Broughton to another place. You can see the administrative areas in which Brant Broughton has been placed at times in the past. Select one to see a link to a map of that particular area. Stukeley supposes that the Roman Station, Brigae, was here. The church contains a monument to Jamys de AUBENEY. Dr. William WARBURTON (1698 - 1779), Bishop of Gloucester, held this parish as his living (he was rector) and wrote here his "Divine Legation." In the 18th and 19th century, hunting was a major activity in Brant Broughton. Sir Richard SUTTON, baronet, who died in November 1855, was considered one of the greatest huntsmen of his time. And check the history of the Wapentake at the Loveden Wapentake website. The parish had a place called "The Fox", but the single entry I have does not identify it as a pub or a beerhouse. I suspect it was a Public House. The Fox is mentioned in 1842 and the victualler is Wm. BRUNT. 1882 James Henry PORTER, vict. Opening around 1800, The Generous Briton Public House is a local center for communication and comraderie. Stop in and ask about their history. Richard CROFT has a photograph of the Generous Briton at Geo-graph, taken in 2006. You can also visit the Generous Briton website for a description and directions. The principal landowner in 1872 was Sir John SUTTON, baronet, who held over half the parish. The rest was held principally by Colonel REEVE, the Rev. Henry HOUSON, William ROLLINGSON, and the DUNN, MILLINGTON, WILSON families. In 1913, the principal landowner was the Earl of Lendesborough, followed by Christopher Henry MORLEY, Mr. Edwin Cartwright SNEATH, Mr. John ANDREWS, Mr. John ROBINSON and Mr. Robert KELSEY. According to the Traces of War website, the St. Helen's churchyard has one Commonwealth war grave from WWII. The Great War Bulletin for November 29th, 1915 tells us that local lad private Hubert Percival CRAGG, age 23, was recovering in the Wharncliffe War Hospital, Sheffield, after losing an eye and suffering a fractured skull while fighting near Ypres with the 4th Battalion, Lincolnshire Regiment on 30 September. He had written home to his family that his wound was healing well. Hubert P. CRAGG, above, was the eldest son of Mark and Fanny CRAGG who lived in Brant Broughton. The name Broughton is common throughout England and it derives from the Old English broc+tun, or "farmstead by a brook". However, this Broughton derives from Old English burh+tun, or "fortified farmstead." It first appears in the 1086 Domesday Book as Burtune, and by 1250 the "Brant" had been prepended to make the name more unique: Brendebrocton. The name Brant could derive from either of two Old English words, Branta or Brent. The first is a personal name, the second means "Holy place" or "high place". Locals pronounce the name as "Brant Brooton". The parish was in the ancient Loveden Wapentake in the North Kesteven division of the county, parts of Kesteven. 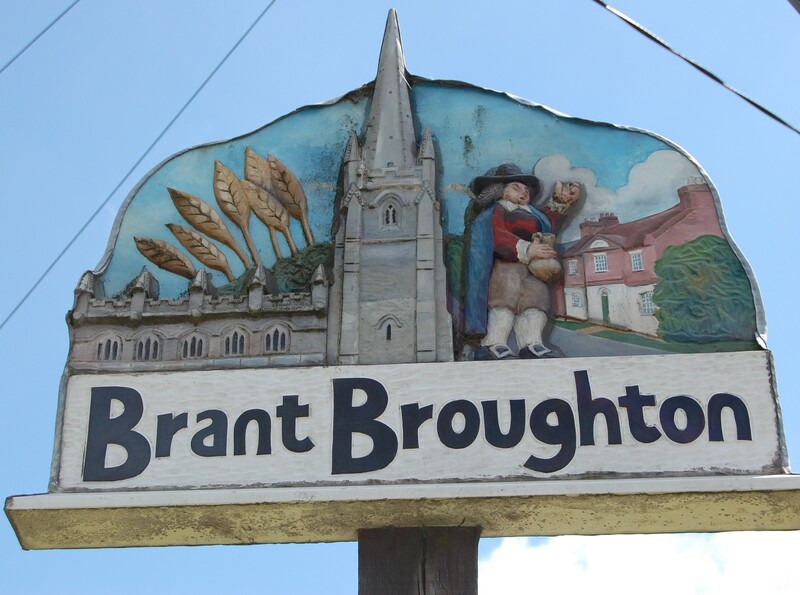 In April, 1931, this Civil Parish was abolished to create the new merged Civil Parish of Brant Broughton and Stragglethorpe. For today's district governance, see the North Kesteven District Council. In 1691, Randolph PATTINSON left a yearly rent-charge of 23 shillings for the poor. In 1736, William TYRWHITT laid out £50 to purchase land for the poor, called the Southing Close. This was then rented by other farmers and the income distributed to the poor. After the Poor Law Amendment Act reforms of 1834, the parish became part of the NewarkPoor Law Union. In 1860, Sir John SUTTON had six cottages erected, each with a small garden attached. These were let to six poor deserving widows of the parish. You can see his almshouses on Geograph, photographed by Jonathan THACKER. Around 1900, a Mr. BUSH left a small charity for the poor of the parish. The Wesleyan Methodists build a school here in 1852. In 1913, average attendance was 40. An Anglican Church school was erected here in 1871, paid for by subscription. It became the Public Elementary school, enlarged in 1894 to hold 163 children. In 1913, average attendance was 76.